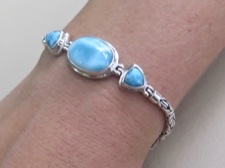 Three fine larimar pieces set in sterling silver with intricate byzantine chain sides. 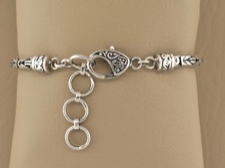 Bracelet closes with an ornate hook that can adjust from 6.5 to 7.25 inches in quarter inch increments. 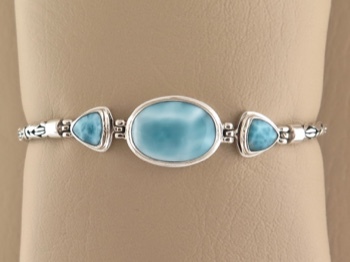 Larimar appeared in jewelry stores in the 1970's in Santo Domingo. A local resident artisan, Miguel Mendez, was the original supplier of this beautiful blue stone. He is the one that named it Larimar - 'Lari,' his daughter's nickname combined with 'mar' the Spanish word for sea. We handpick all the larimar stones for our exclusive Caravan Collection and have them set in sterling silver by master craftsmen. This is a graceful and pleasing style.